Never in the history of the Church has the laity been so well educated. At the same time, never in the history of the Church has there been such a poor understanding of the faith among Catholics. Join us for this eight week program that will deepen your understanding of, and love and commitment to, the Catholic faith. The Catholicism 201 will be proceeded by the ten week Alpha Course as an introduction to the Christian faith and to the method of the course. Where did we ever get the idea that religious education is only for children? In this day and age Catholics need more than ever to be able to integrate intelligently their faith into their every day lives. 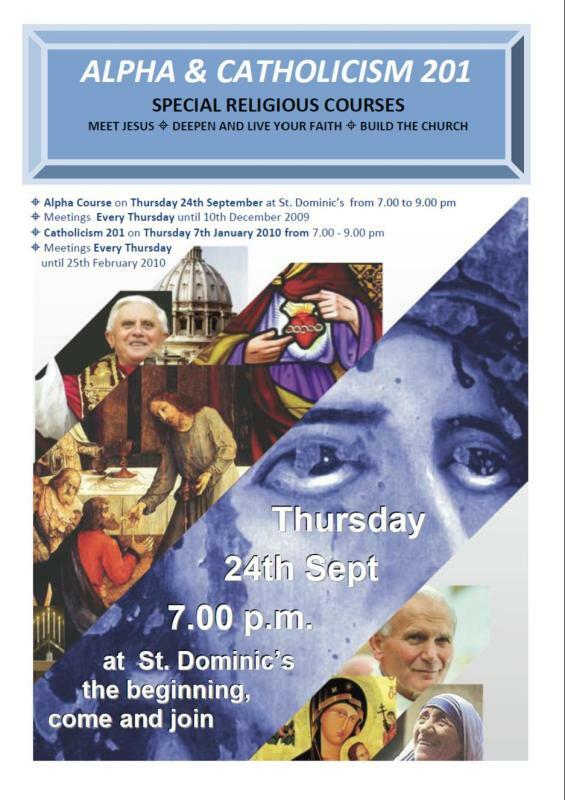 This course has grown out of our experience of Alpha, after which many people said, “What next?” This program was developed to cover the areas of our Catholic faith not covered by Alpha (hence Catholicism 201). You do not need to have taken the Alpha program to come and benefit from this experience. This is a course for adults and youth, it is for you!